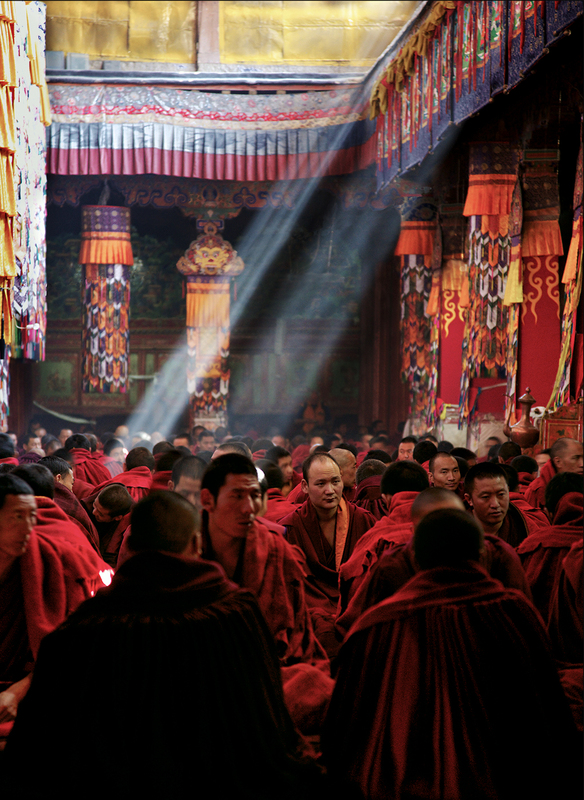 In September of 2006 I travelled to Tibet. It was a wonderful trip rich with opportunities for photography. At the time I was using a Canon 1DS MKII with a good selection of Canon lenses. I loved that system. Now, eleven years later, I am using a Sony mirrorless system and I am heading back to Tibet. Changes in photography are very much on my mind as I prepare my equipment for the upcoming challenge. The Canon 1DS was a lovely piece of equipment. A big brick of a camera it looked, felt and was very expensive. Trekking at 5500 m with that camera, a 100-400 mm, 16-35 mm, 24-105 mm, 100 mm macro and 24 mm TS lenses added up to some fairly serious suffering. The system was versatile but even so Tibet offered a few challenges. The range of subject matter to start with. You have magnificent landscapes with a dark blue sky, snow and pitch black shadows. Interiors of dimly lit smoky buildings where tripods are not welcome. Curious locals that are attracted to flashy photographic equipment. Vibrant street photography. Police and military that can be a little suspicious of tourists with serious looking cameras. The big question is how do I expect the little mirrorless Sony system to stack up? Well for starters I am traveling with two bodies instead of one, the A6000 and the A6300. Why not, the two Sonys together weigh less than the 1DS? This not only gives me redundancy in case a camera is dropped, lost, stolen or simply breaks down, but also allows me to carry bodies with different lenses mounted for quick use when doing street photography. The lenses I am taking for the Sony system are as follows; 10-18 mm, 18-105 mm, 55-210 mm, 16-50 mm pancake, 19 mm, 30 mm and 60 mm. This Sony system is both lighter and considerably more versatile than the Canon DSLR. It’s not like the cameras don’t match up in terms of quality. The A6300 and A6000 Sony cameras have higher pixel counts, massively improved high ISO performance, better auto focus, silent shooting and 12 frames per second frame rate. Despite the size and price differences the little mirrorless cameras beat the large Canon in almost every way. One significant area that I have to make allowances for is batteries. Mirrorless cameras are much less energy efficient than DSLRs and require more batteries so I will be carrying ten. Actually the changes are significant beyond comparisons of weight and cost. Better dynamic range, less intrusive design and quieter and faster with more accurate focussing. That all adds up to a system that puts the attention back on the image and away from the equipment. It allows me more time to concentrate on what I want to say and to spend less time fooling with equipment. These are changes in photography that I believe will result in better images for me. Images that better reflect my personal vision. Outside of equipment there have been many changes in photography. The one I wish to touch on here is social media. On my next trip to Tibet I intend using social media to keep up with friends and clients. I will use Instagram, Facebook and this website in order to do so. Check out martinmkdp for frequent updates on Instagram. NextNext post:Could You Live On Ice Cream? Good to read your posts and well written as always. See you on the 1st.